This entry was posted in 52 weeks of Personal Genealogy & History, Brisbane, Kunkel Family History, Queensland and tagged 52 weeks of personal genealogy & history, Banyo Seminary, Pellegrini's by cassmob. Bookmark the permalink. 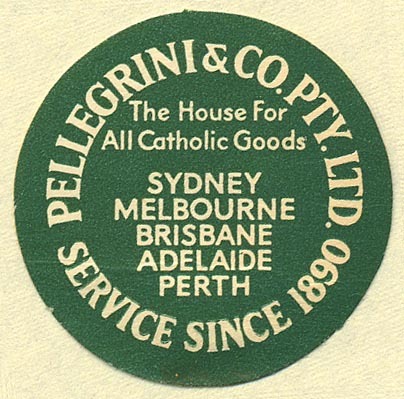 Thanks for the memories – I had forgotten what an important spot Pelligrini’s in Elizabeth Street, Sydney was for Catholics. Not just school books but holy cards, rosary beads and religious statues were purchased there. I remember Pellegrini’s in Brisbane very clearly. We used to sneak in there to buy the tiny blue enamel St Christopher medals to put on our watches. And why did we sneak in there? Because we were St Aidans girls – and it was pretty well forbidden for us little Anglicans to go into Pellegrinis because it was – yes – a Catholic shop. But the staff there always served us happily. And we turned the watches round so the blue didn’t show. I was born in Toowong, my dad was the dentist at Toowong for 20 plus years, and we lived in Auchenflower. Toowong State School, then St Aidans. Happy days.